So glad you all like the chocolate maca milk! I can’t wait to get back to my blender so that I can whip up another batch. As I mentioned in yesterday’s post, I had a chance to make a couple of Halloween-themed treats last week before I left for New York. For someone who’s basically a subpar crafter and decorator, I was pretty proud of the spooky finger cookies you see above! They were super fun to make, and even more fun to eat. And I’m now I’m here to show you how you can make them at home, too. I got the idea for these cookies from Chloe and Kim, who have each created fantastic baked vegan versions of this popular Halloween treat. 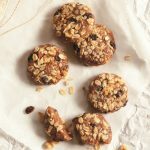 I wanted to create a version using nuts, seeds, and dates — the standard base from which I create all of my cookies, snack bars, pie crusts, and crumbles. As I was rustling around to see what sort of nuts were handy, I discovered a bag of sesame seeds, and realized that sesame is a highly underutilized ingredient in my kitchen. I love the taste (tahini is one of my favorite things in the universe), but for whatever reason I shy away from using sesame seeds, except when I’m making homemade gomasio. This was a perfect opportunity to put sesame flavor to use in a sweet recipe. 1. Blend the berries and chia in a blender till smooth. Transfer to a mason jar or glass and allow it to thicken into a "jam"--ideally, you want to let it sit overnight, but a few hours will work. Add an extra tablespoon of chia if it's too thin. 2. Add the sesame seeds, cashews, and salt to a food processor fitted with the S blade. Grind for about 15 seconds, or until they're broken down. Add the dates and continue processing until the mixture resembles a crumbly, sticky (but not too moist) raw "dough" (similar to what you'd aim for if you were making homemade Larabars!). 3. Take a small handful (maybe 3 tablespoons) of the dough and roll it into a strip that's about as long and wide as a finger. Shape it to form knuckles and a fingertip. 4. Use your finger to make an indentation at the tip. 5. Add a small amount of the jam to the indentation. 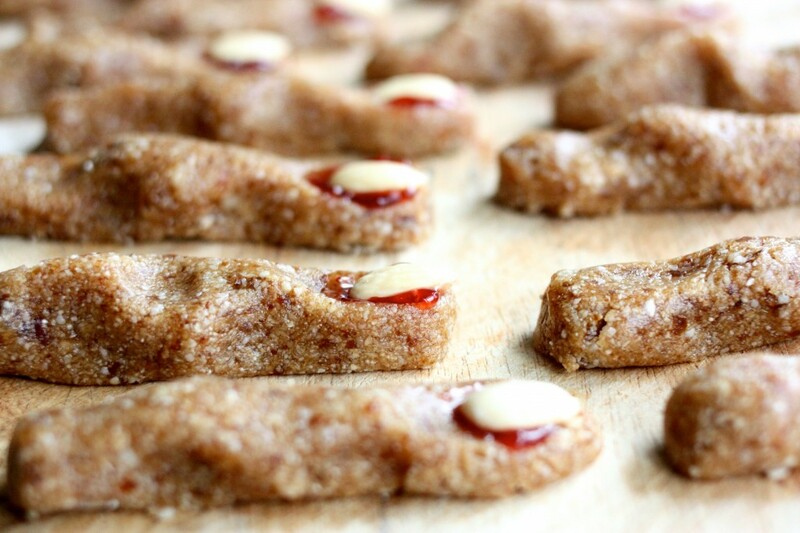 Press a blanched almond on top to create the fingernail! Serve. Makes about 16-20 cookies. Stored in the fridge, these will last about a week. Note that this recipe can be even simpler if you use a store-bought jam of your choice (or homemade jam that you’ve stored). I keep the extra strawberry chia mixture to spread on Ezekiel toast with some coconut butter (yum! ), but no need to make it if you’d like to streamline the process. I’d imagine that this is a really fun recipe to make with kids. But if you’re a big kid like me, don’t hesitate to make it and keep it all to yourself (well, actually, I shared my batch with Valerie, who initially looked a little confused/grossed out but was ultimately won over by the sesame flavor). If you don’t have sesame seeds, it’s no big deal. You can use all cashews (1 1/2 cups total), walnuts, or almonds. This should be a very flexible, forgiving recipe. I hope you enjoy it. Previous Post: « Chocolate Maca Almond Milk. 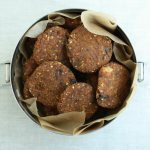 Bonus Recipe for Chocolate Maca Macaroons. Yum! I love sesame, so I’m sure I’d enjoy these. 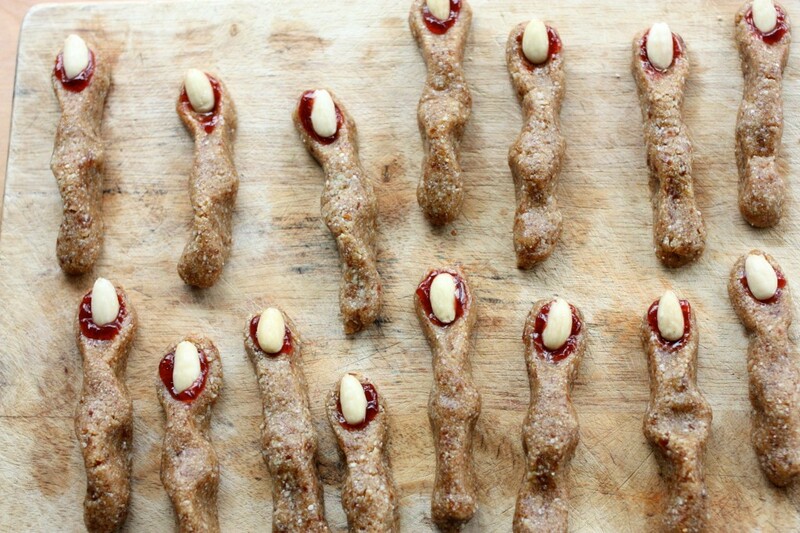 You did a really good job shaping these cookies to look like fingers, by the way. Haha! I think it’s the knuckles. Now I’m inspired to make some festive vegan treats of my own! These are creepy in the best way possible. PERFECT Halloween treat! Eeeeewwwwwww, warts! Haha. Good thinking. These look awesome! I love that you even made raw jam for them! So creative. this is sooo freaking creative – love the jam idea very much with it. These look so fun, thanks! These are awesome! They look totally, totally freaky (in the best way). 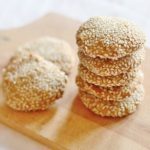 I used to make a sesame maple cookie that was sooo good – I love sesame in sweet treats! These are adorable! And look so easy to make! I know this wouldn’t be raw but I’m wondering what would happen if you baked them just to get them more firm. Or perhaps dehydrated them? So sorry you had that experience, Fiona. Can I ask what about the taste didn’t work for you? What was that in a recent post about not being creative? These look awesome! I love the Halloween themed foods!! Hmm, it’s hard to put my finger on it. I did the all cashews option so that might have been it. It wasn’t quite sweet enough I think. I think I expected it to taste like a sweet dessert ball. I know I’ve had mixtures of nuts and dates from your recipes, Oh She Glows recipes, and Chocolate Covered Katie recipes that I really liked. It was just this particular mixture that didn’t turn out well. I tried adding honey and more dates but it only made it a bit better. I think next time I will stick to the recipe instead of subbing different nuts! They were incredibly cute though! Hmmm. I think with sweetness, it can be really hard to say what will work for folks. I may change the serving of dates to “1 heaping cup” — I want to be sure it works for people. Thanks for letting me know. Or maybe just a note that if you like things on the sweeter side to add more?? It might just be me! 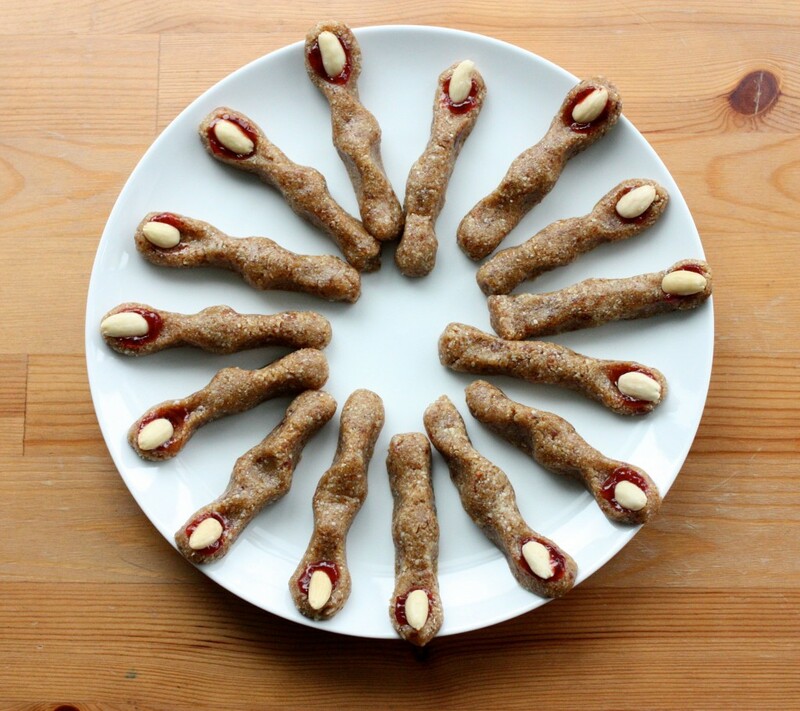 These witches’ fingers look so great, Gena! 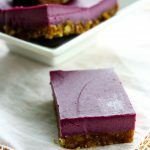 I made a more traditional version with a vegan shortbread a few years ago for a halloween party, but this raw version sounds much more my speed. I also used to underutilize sesame seeds, but now I find myself adding them to all sorts of sweet and savory dishes. 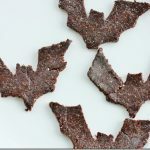 I just know I’ll love these spooky treats!